BIOPTRON Light Therapy is a worldwide patented lysterapeutisk and medical therapy form. It has a special optical device, which emits light, which is very similar to the portion of the electromagnetic spectrum which naturally produce the sun - only without UV. BIOPTRON Light Therapy acts in a natural way, which supports the body's regenerative and balancing properties, and thus helps the body to release its own innate healing potential. When the light energy delivered to the body's tissues, promotes the process of bio-stimulations; that is to say it stimulates various biological processes in the body in a positive way. This strengthens the body's functionality. The technology behind BIOPTRON used and accepted in the vast majority of the world's countries as a user-friendly, effective, non-pharmapseutisk medicinally product. Through over 15 years of worldwide clinical research has BIOPTRON proved to be a great support to the conservative management of acute and chronic injuries as well as post-operative wounds. The philosophy of healing has begun to re-influence the medicinal market transp: "Primum non nocere" ("First, do no harm") and "Show Medicatrix Naturae" ( "Honour nature's healing powers"). The lysterapeutiske BIOPTRON lamps have been found medical apparatus according Directives 93/42 / EEC. BIOPTRON light has a bio-stimulating effects - Using BIOPTRON light stimulates the body's light-sensory intracellular structures and molecules. This initiates cellular chain reactions and triggers so-called secondary responses. These are not limited only to the treated area of the skin, but involves the entire body. BIOPTRON Light Therapy stimulates and modulates replacement skilled and regenerative processes in the body and processes of our immune system. 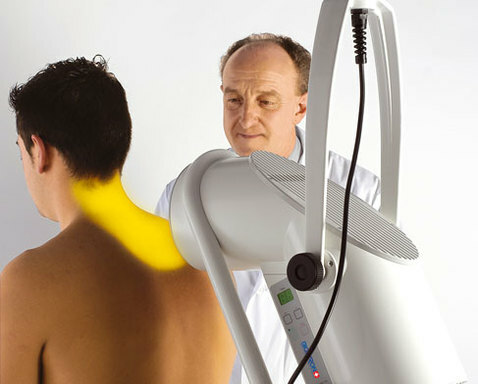 BIOPTRON Light therapy works in a natural way, by supporting the body's regenerative capacity. This helps the body to release its own innate healing potential. The use of BIOPTRON light as a therapeutic tool has been popular widely since its development for more than 15 years ago. Questions and Answers on Bioptron Light Therapy TechnologyWhat is Polarised Light?Polarised light is defined as light waves that move in one plane only. Laser light diffuses in a similar manner but unlike BIOPTRON, it consists of only one wavelength. This means that it is monochromatic light, whereas BIOPTRON is polychromatic (emission of multiple wave-lengths). The wavelength of BIOPTRON is between 480 - 3400 nm (nanometres). What is Biostimulation Through Polarised Light?Biostimulation is the re-activation of cell functions to enable regenerative processes to take place again. This effect is directed to those cells that have been damaged or do not function efficiently any more. Polarised light has a balancing effect on cell membrane activities. Polarised light goes a step further than what happens through natural sunlight. When and Where Was the Effect of Polarised Light Discovered?By 1966 the first lasers had been developed that could achieve a biostimulation effect on human cells. In 1981 a team of physicists and doctors conducting research into the biological effects of laser light came up with the idea of developing a polarised light-emitting device that did not have the negative parameters of a laser. This research ended in the development of the BIOPTRON Lamp. In 1988 the first BIOPTRON Lamps were manufactured and sold to various professional users and to the public as a health care device. What Applications are Possible With the Bioptron Lamp?The human body consists of trillions of cells. Each health disorder is reflected mainly on a cellular level. The problem, minor or severe, is shown by the amount of cells affected. BIOPTRON works on a cellular level. This naturally means that the beneficial effects of the polarised light emitted by the BIOPTRON lamp can be used to treat a wide range of medical as well as cosmetic applications. Skin irritations, pains, wounds, and the immune system can all benefit from the BIOPTRON Light therapy. Medical doctors and health care professionals around the world recommend the use of the BIOPTRON therapy to accelerate regeneration and healing processes. Are The Bioptron Light Therapy Devices Medically Approved?Yes. They are approved as medical devices according to 93/42/EEC (the EEC-Directive competent for Medical Products). This is the responsible and official European directive for ALL medical products which are produced and sold in the EEC. BIOPTRON devices are also certified under the highest International standards for quality and safety ( ISO 9001 / ISO 13485 ), BIOPTRON devices are registered by the United States Food and Drug Administration (F.D.A.) - Reg no: 3003775404, as well as by relevant authorities in the many other countries where they are used and sold. Do Medical Doctors Prescribe Polarised Light?Yes. In fact many Medical institutions around the world have helped to develop the BIOPTRON V.I.P. Light technology. Certain medial insurance companies even pay for the therapy. Bioptron is employed as a therapeutic device by over 5 000 Doctors and is used in more than 1 000 clinics and health care centres worldwide. Is Polarised Light Applied In Clinics And Hospitals As Well?Yes. Many hospitals in numerous countries around the world use the BIOPTRON in various medical fields. In Which Country Is The Bioptron Lamp Manufactured?All BIOTRON products are manufactured in Switzerland at the Company’s own hi-tech manufacturing facilities in Wollerau, close to Zurich. In Which Countries Is The Bioptron Lamp Being Sold?In over 40 Countries and growing, including Eastern and Western Europe, Asia, Australia, New Zealand, United Kingdom, South Africa and USA. Are Bioptron Devices Used Only By Medical Professionals?Bioptron devices are used by Medical professionals as well as by over a million end-users at home. They are completely safe to use and very simple to operate. There are three different sizes of devices in order to ensure the best-fitting solution for every individual need – for the Medical and Beauty professionals, as well as for the private home-users. In Which Medical Areas Can Bioptron Light Therapy Be Used?For specified medical indications in the areas of Pain Treatment, Sports Medicine & Physical Rehabilitation, Wound Healing, Skin Disorders and for various disorders in Children and Infants. Is Bioptron Effective In The Area Of Beauty Therapy?Yes, absolutely. Bioptron Light supports cell renewal, the flow of nutrients and the synthesis of collagen which keeps the complexion flexible. Thus, Bioptron can refine existing wrinkles and prevent premature formation of new ones. Bioptron also supports the improved absorption of active substances contained in cosmetic preparations and creams, thus enhancing their effects. Many leading Beauty therapists and home-users worldwide are using Bioptron to add value to a wide range of treatment regimes. What Has To Be Observed Before And Whilst Operating The Bioptron?Make sure, when the lamp is switched on, that the air ventilation grid is not covered in order to allow good ventilation. Always switch the lamp off at the lamp switch itself before removing the wall plug. What Is The Life Expectation Of The Light Source?Approximately 2 000 hours. How Long Do I Have A Guarantee On The Product?The high-tech production of the BIOPTRON lamp guarantees our world-wide customers the quality expected from a Swiss manufacturing company like BIOPTRON AG. We supply a 1-year guarantee on all BIOPTRON products. Whom Can I Ask For Further Information?Please ask your authorised distributor, or read the BIOPTRON Light Therapy booklet where you will find most of the answers to your questions. How Deep Does The Bioptron Lamp Penetrate Under The Skin?A four minute treatment will let the light stimulate cells approximately 2,5 cm under the surface of the skin. The longer the light treatment is applied, the deeper the light can penetrate. Due to the fact that the BIOPTRON light also treats blood cells that pass through the irradiated treatment area, the immune system is being reinforced (photomodulation of blood). The beneficial influence of the BIOPTRON light is transported much further than the area that is being treated (BIOPTRON has a SYSTEMIC effect). BIOPTRON has a BIOSTIMULATORY effect: - the human organism transforms BIOPTRON VIP light into electrochemical energy, which activates a chain of biochemical reactions within the cells. Cellular biological processes are modulated, metabolism is stimulated, and the immune response of the entire human body is reinforced. How Should The Skin Be Prepared Before The Therapy?Clean the skin thoroughly by using a mild cleansing milk or skin cleanser. The skin should be cleaned before treatment so that the light won’t be distracted through reflecting particles on the skin (oil, perspiration, etc). After cleaning, you may apply a thin layer of OXY SPRAY before starting the therapy. Can The Bioptron Penetrate Through Clothing Or Wound Dressings?It is always best to shine the BIOPTRON light directly onto the bare skin. Shining the light through clothing will diminish and may even negate the effect of the therapy. Regarding wound dressings; Opsite, Adaptic and Tegaderm wound dressings do not significantly reduce the effects of BIOPTRON Light Therapy. With thicker bandages and wound dressings that may reduce the penetration and effectiveness of the light, one can treat the bare skin area immediately around the dressing. This will cause a positive and rapid increase in blood supply to the wound area, as well as activating the local immune response to accelerate the wound healing processes. What Should The Distance Be Between The Skin And The Lamp?The light should be focused at a right angle (90o) from a distance of approximately 10 cm (4 in) from the skin on the area to be treated. For the treatment of inflammation, one should use a larger distance due to the temperature sensitivity. Skin temperature rises during the light treatment approximately 1° to 3°. Common sense dictates that one should always monitor skin temperature whilst using the light. How Can I Support The Effect Of The Bioptron Lamp Optimally?Spray a thin layer of Oxy Sterile Spray onto the skin. 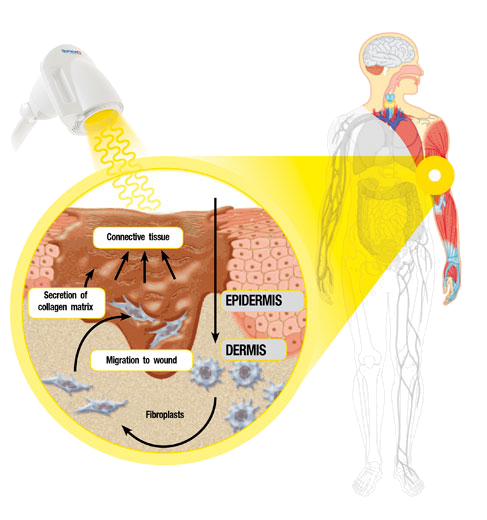 Through the help of this unique spray, the skin gets supplied with more oxygen and the infection risk is reduced. Is The Bioptron Safe To Use On The Eyes?Yes. It is recommended that the eyes be closed during eye treatments so as not to focus the light directly on the retina. Does The Bioptron Have Any Harmful Side Effects?BIOPTRON Light Therapy has been used for more than 15 years in millions of applications worldwide, and until now no harmful side effects are known. Is This Light Similar To The Infrared Lamp?Not at all. Whilst the spectrum of the BIOPTRON contains a fractional amount of infrared, the wavelength of the light is much broader. There are no thermal (heat) hazards with the BIOPTRON Light Therapy System provided it is operated correctly (10 cm away from the wound area). Occasionally, such as in certain ACNE treatments for example, the condition may get worse before it gets better. What Is The Difference Between Sunlight And Bioptron Light?BIOPTRON light is Polarized, and in contrast to natural sunlight it does not contain UV (Ultraviolet) light or any other harmful rays. The technically synthesised BIOPTRON light provides light therapy with controllable and therefore reproducible parameters. Could The Light Cause Cancer In Any Way?No! The dangerous light range for cancer is low UV at 250 nm (nanometres) and below. The BIOPTRON’s lowest wavelength is 480 nm. While Applying The Bioptron Light, Can I Do Anything Wrong?Wrong handling only reduces the optimal effect of the BIOPTRON light. Wrong application can not lead to any health hazard! Remember to maintain the correct operating distance of 10cm. Must I Consult A Medical Doctor Before Application?Generally, no, but if no notable improvement can be achieved, consult a doctor or a specialised therapist or beauty consultant, WHO HAS EXPERIENCE WITH BIOPTRON light therapy. Your local BIOPTRON Distributor may be able to refer you to a professional who has had experience in dealing with your type of problem. For more serious disorders it is generally recommended that you consult your Physician or Therapist before using BIOPTRON in order to receive professional advice to establish whether other medical or surgical interventions are also required for your particular condition. Traumatic injuries – cuts, abrasions, bruises. Can The Lamp Be Utilised On Injuries?Yes. The wound has to be disinfected first, then use the Oxy Sterile Spray before applying the light treatment. The natural healing process is very much enhanced. Is The Bioptron Safe To Use During Pregnancy?BIOPTRON may only be used on pregnant women provided the pregnancy is healthy and normal. Pregnant women should always consult their doctor / gynaecologist before commencing BIOPTRON light therapy. May Bioptron Be Used By People With Heart Pacemakers?People with heart pacemakers may safely use the BIOPTRON lamp provided they don't touch the actual lamp unit whilst undergoing treatments. Pacemaker wearers should utilise the BIOPTRON stand during treatments to prevent the BIOPTRON unit from coming into direct contact with their body. How Often Should The Bioptron Lamp Be Applied?Acute cases: 2 x per day. For chronic cases: daily or 3-4 times per week. For severe cases: every 6-8 hours. Can The Bioptron Lamp Be Applied Too Often?No. But the local effect usually cannot be increased by applying more often or longer than described in the BIOPTRON Light Therapy booklet. However, more frequent treatments may result in a more rapid SYSTEMIC effect as blood photomodulation is increased. There are no harmful side effects if the BIOPTRON is used longer or more frequently. It is recommended that after each 5-7 day treatment period, BIOPTRON treatments be discontinued for 2 days, then resumed. At What Time Of The Day Is It Best To Use The Bioptron Lamp?Morning and evening. Much more important than the time of day, is that you have time for the treatment and you can relax while applying the light therapy. Are There Different Bioptron Devices And Different Sizes?Yes. In order to assure the best-fitting solution for every need, the range of BIOPTRON devices includes three different types of devices. This enables optimum effective handling and use by both medical professionals and home-users. They differ in size and design, but all three devices emit light with identical physical and technical characteristics. The Bioptron Compact III has a filter diameter of 4cm (spot size 19cm²). The Bioptron Pro 1 has a filter diameter of 11cm (spot size 154cm²). The Bioptron 2 has a filter diameter of 15cm (spot size 254cm²). What Is Bioptron Colour Therapy?BIOPTRON colour therapy is a self-help, holistic treatment regime. A comprehensive colour therapy treatment manual is supplied with the colour therapy kit. Colour Therapy lenses are optional accessories and are made in two different sizes to fit directly on to either the BIOPTRON COMPACT III or the BIOPTRON PRO 1 models. Treatment times for colour are specific: 1 minute: “Tonifies”, 2 minutes: “Sedates”, and 3 minutes: “Anaesthetises”. Most colour programmes aim to sedate energy fields that are over-active (ie: stress areas).